This website is owned by Rörsch & Partners, the original designers and developers of the Salamis Foundation website, the facebook page and other promotional activities. We also prepared all the plans as mentioned on these pages. All plans are copyrighted and may not be used without our written permission. The Salamis Foundation as was set up in june 2015 in Greece has no relationship to our activities. 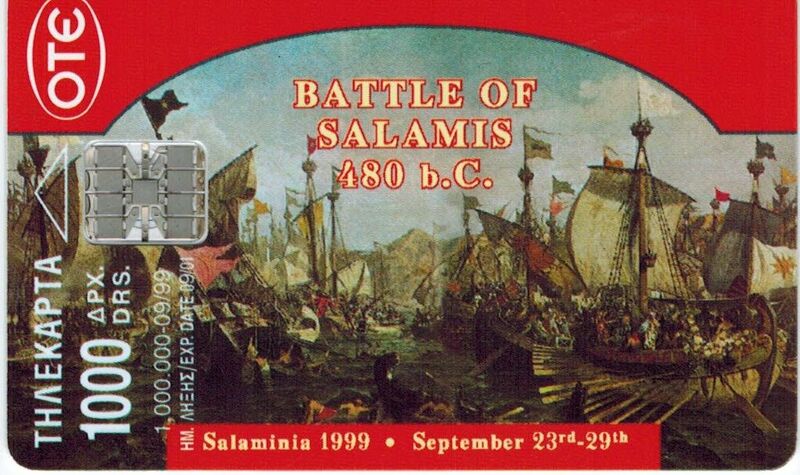 -We have been celebrating the Battle of Salamis for many years now, to be exact for 2493 years. important event and of the history of Salamis. - We call it for the moment: “ The Historical Battle of Salamis Project” ??? - The municipality of Salamis has offered the use of a piece of land near Kamatero. - We are currently starting a non-profit foundation as the leading organizer for this project. - The foundation will have to find the financing to design and build this project. - We expect to find the financing through donations, loans, financing from interested people, governments and the EU. - If you see any possibility for any form of financing or other assistance, please let us know. Christos Maridakis, Yiannis Platanistiotis, Erik Rörsch and Kyriakos Maridakis. 0. To prepare a tourism plan for all of Salamis Island. 1. To create, build and manage the Historical Park representing The Battle of Salamis, in any possible way, at Kamatero. 2. To create, build and manage the St.Giorgio Island public educational, historical and creative park. 3. To create, build and manage the Ambelakia archeological park and museum. 4. To create, build and manage the St.Giorgio historic shipyard. 5. To create the possibilities of ferries and buses linking all these properties, as well as the Tourla Quarry Project. 6. To initiate the creation of The Tourla Quarry Project. 0. A complete tourism development plan must be made for all of the island in order to optimize the development, for tourism and the economy, for all of Salamis Island. 1. Aim of the project; explaining in as many ways as possible the importance and history of the Battle of Salamis, as well as it's influence on Europe and world history and civilization. The Foundation will rent/lease the land in Kamatero for a period of 50+50 years, which is needed for the project from the Municipality and possible other owners. The price of the rent will be determined later and will be in line with the market prices, based on a %% of the entrance fee. The property outline is defined in annex A. The property outline includes space around the planned project for the mooring of ships older than 100 years old as of January 1st, 2012. 2. The St.Giorgio Island public educational, historical and creative park will be fully integrated with the Kamatero project. Except the setup is different. It will be a public entrance free park with all kinds of (paid) attractions in it. While at Kamatero people will have to pay to get in. 3. The Ambelakia archeological park and museum will be created on and around Ambelakia bay. It will be developed in close cooperation with the local and governmental archeologists, as well as with foreign archeological institutes. It will consist of an open park around, on and in the harbor. And a proper museum to represent the history of Ambelakia bay. - The re-construction of one or more trireme and similar ships. - Providing training and education to people at a distance from the labor market. - Building wooden ships that were important in Greek history. - The maintenance of these vessels and equipment supporting museum and craft workshops that belong to a historic shipyard. - The development and use of traditional craftsmanship for new purposes. - The development and transfer of knowledge in the field of historic shipbuilding. - Make our knowledge and experience accessible for a broad public and of marine historical information. - Providing the ability to “”sail”” for cultural purposes, such as commercial and non-commercial nautical and historical events and commemorations. 5. Ferries and local buses for guests will be needed to link all the projects together (and to avoid to heavy traffic on the local roads), besides this is very much environmental friendly. 6. The Tourla Quarry Project, is presently shown on our website. It is to re-create a proper environment, currently it is a disaster area. And to include solar power, unique attractions as well as a cable-way on and to this area. 1. The aim of the Historical Educational Park is to explain in as many ways as possible the importance and history of the Battle of Salamis. It's influence on Europe, world history and our civilization. We expect this project will attract visitors to all of Salamis. 2. To create also a project where people can be trained for a job and where the unemployed can find new ways (see for example: www.bataviawerf.nl) to work and to preserve our shipping heritage. 3. Besides it is time to restore Old Salamis harbor to it's old glory, which is also our intention (page 2 annex). In order to create The Battle Project as a cultural, educational, fun project a pre-master plan and a master plan must be made. Taking into consideration the archeology, history as well as educational, environmental and fun points needed to make a nice and profitable project. The project could consist of many different items; from an educational center to a shop, theater, restaurant, water-plays, interactive activities, a major Battle attraction and more. The Battle Project is a shipyard with extraordinary ambitions, reconstructing ships from the Golden Age that were important to the Greek maritime history. This heritage was demolished at the time because of its limited lifespan, or has sunk to the bottom of the sea. In April 2015, the Trireme called Christos – Salimina , which is the most authentic reconstruction of a ship ever made, will be launched after three years in the making. The initiator was commandor Christos Maridakis. After this reconstruction is completed, a second project will be started in the yard to reconstruct The Mystery, a 17th-century battleship having fought many sea battles. The construction of the replica of The Mystery is one of the largest and most challenging historical shipbuilding projects in the world. Using vocational reintegration and work experience projects to construct these ships, the shipyard plays an important part in the lives of long-term unemployed people for whom, over time and for various reasons, the distance to the job market has become too great. Having official ‘Charity Organisation' status, The Battle Project is a non-profit foundation that is dependent on donations and sponsors to construct and maintain the ships. The conservation of cultural heritage, traditional crafts and working methods. We bring to life the stories of the people and their work and lives in the past 2500 years. Traditional crafts are revived in the various workshops, such as the woodcarving workshop, the forge and the rigging workshop. The Battle Project offers visitors the opportunity to learn hands-on from the past. The Battle Project is different from others because no concessions are being made during the building process. The shipyard performs extensive historical research into the construction, work methods and use of materials in the 17th century. Kamatero Yard's accumulated expertise is unique in the world and makes it possible to build reconstructions that are very true to life. The construction of the ships provides new knowledge about shipbuilding from that era, something we call ‘experimental archeology'. The Battle Project will certainly not lay idle in the coming years. There are several projects in the pipeline that will make significant cultural and social contributions. Furnishing and regular and intensive maintenance of the Trireme are scheduled, as is the completion of The Mystery, of course. These projects will provide work at the shipyard for many long-term unemployed people and volunteers. Old crafts are being brought back to life in the various workshops at Kamatero Yard. The character of the ships is expressed primarily in the woodcarvings. Take a look inside the woodcarving workshop, visit the rigging workshop or follow the sound of hammers striking iron and the smell of a blacksmith's coal fire. Outside are many traditional Greek vessels, which are at risk of outright extinction, so the trehantiria the karavoskaro, Perama and other ornaments of the Greek seas, continue to live in today and tomorrow. - During the past 2500 years very little archaeological research has been done on the island of Salamis and especially not around the old Salamis harbor. The Salamis harbor was very important in history because of the famous Battle of Salamis in 480 before Christ (see annex). This battle changed the culture and economy of all of Europe. - The people of Salamis have become much more conscious of their past in the last 5 years (see quotes below). -The current mayor, Mr.Yiannis Tsavaris, is also very much aware of the past and its importance for the future. - A new cooperation agreement has been signed in 2011 between the original 23 municipalities involved in the battle. They all would like to see a proper research done, as it is also of importance to them. Our company was invited at the end of January 2012 by the municipality to visit the island. One of the items discussed was the possibility of creating cultural, educational environmental friendly, tourism, related interesting projects and creating an organization for tourism for the Island as a whole. New archaeological research on all of the island will be a major part of the plans, to start with Old Salamis Harbor. One of the questions asked by the Mayor was if it would be possible to find an international organization and sufficient funding to start the archaeological research in and around the properties of the Old Salamis Harbor. In annex 4b-1/2 of the full presentation (available upon request) you will find the properties which are considered. A long time ago a small research was done, but the results of this research are currently in a bad condition (see picture below). Part of the property next to the harbor has not been built on and can be used and entered immediately, it also has proper roads leading to the property. The municipality might even be willing to allow to dry pump the Eastern part of the harbor allowing for easier access to the bottom of the harbor. The Western part has unfortunately been destroyed by several nasty shipyards. When the research has started the municipality is also willing to create an educational center/museum and, if allowed by the ministry, to create an open air museum of the researched archaeological area's, including the ongoing research. We hereby kindly request your help in finding the appropriate organizations for the archaeological research as well as their funding.